There's been much speculation that Apple's next iPhone will come with a unibody, two-tone design, a significant departure for the company. But fewer people have bothered to ask why. Industrial designer Don Lehman does here for The Tech Block—and comes up with some convincing answers. The image above could be one of four things. 1. A very elaborate hoax. If it's a hoax, kudos to whoever made it because it would require the same amount of design and engineering effort that would go into an actual smartphone. Not to mention all of the collaboration that would have been needed between the numerous different sites that have posted images and video already. That's an insane amount of work for a laugh, so I don't think it's a hoax. 2. A decoy made by Apple to throw everyone off the scent and root out leaks. Now THAT would be amazing. I'm secretly rooting for this option if only because it would be so diabolically awesome. 3. An early model or sample of a design that Apple is working on. Maybe, but we have seen this same design pop up in too many places and it looks way too far along in development to be a model or early sample. 4. An actual production sample of the next iPhone. This is where I would put my money. I'm fairly convinced this is what the next iPhone will look like. If true, this design will be noteworthy for being the first unibody iPhone, making it the thinnest, strongest, and lightest housing to date. Two things stand out right away: A "taller" proportion compared to traditional iPhones and the wraparound metal backplate. The taller proportion lines up with the rumored 16:9 ratio screen. Essentially, the screen is the same width as the current iPhone, but it is now cut taller. (Or wider depending on which way you are holding the iPhone.) There are several advantages to this, all outlined in this post on the Verge's forums by modilwar. The wraparound metal back is where my interest in this design is centered on. It's an evolution of the current iPhone 4/4S case design that seems like not a big deal but actually would allow for several improvements. To understand this design, you need to understand the evolution of the 4/4S antenna. The 4/4S steel band that runs through the middle of the device acts as an exoskeleton. It provides the protection and support structure for all the components inside. It also doubles as an antenna. 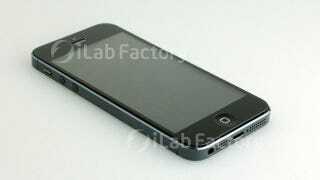 When the CDMA version of the iPhone 4 came out in February 2011, the design of the steel bands changed. This design would also carry over to the 4S. The 4S's steel band is comprised of four pieces of steel: two U-shaped pieces at the top and bottom, and two long, flat pieces on the side. The steel sections don't actually touch each other - they are separated by a .65mm piece of plastic. The way I understand the 4S cell antenna to work is this: There are two antennas, one at the top U bracket, and one at the bottom U bracket. The flat steel sides are only there to visually continue the metal band all the way around the phone and for structural reinforcement. The GPS, Wi-Fi, and Bluetooth antennas transmit out of the glass backplate. Long story short, instead of using the entire metal band for antennas like in the 4, the 4S only uses the top and bottom sections as antennas. Since the flat sides don't contribute to transmitting signal and only help with the structure of the device, it makes sense to make them even more integral to the structure. This is what makes a unibody iPhone possible. The leaked design has three pieces of metal instead of four. It still has two U-shaped pieces at the top and bottom, but this time the two flat sides become one single piece of metal that also comprises the back of the device. That single piece of metal is the unibody backplate. The same properties that unibody designs give to Apple's laptops apply to this design as well: stronger, lighter, and thinner. You can see from this picture the tool path of the CNC machine that made the unibody backplate of this design. The tool path sort of looks like the lines that are made when a farmer plows a field. This started out as a single block of metal and the CNC carved that metal out until you have what you see here. You can also see the bosses (screw attachment points) that are part of this unibody backplate. Those aren't separate pieces - those are part of that same unibody piece. They are the most important detail of this design. Having those bosses integrated into the material allows for the part to be stronger, thinner, and lighter. It condenses several parts into one better part. Thinness is a major feature of this design. Take a look at your iPhone 4/4S from the side. Now imagine that the new design is only as thick as the metal band. That's a big deal. From my estimates, that would make this design anywhere from 2-3mm thinner than the iPhone 4S. That sounds small, but it's a huge difference. That's as much as 32 percent thinner. As a point of comparison, the Retina MacBook Pro is only 25 percent thinner than the old MacBook Pro. Even though this design is taller because of the new 16:9 screen size, it should also get a bit lighter due to how much thinner it's getting and the part reduction made possible by the unibody backplate. The question of how much lighter depends on the type of metal they use. The 4/4S uses stainless steel in the metal band. Stainless steel is much denser than aluminum, which makes it more resistant to wear and tear, but also heavier and harder to machine. MacBook Airs, Pros, iMacs, keyboards, etc. are all machined from aluminum, but they also don't take the same amount of abuse that a smartphone does. I can't tell 100 percent from these images, but if I had to guess, this design will stick with stainless steel for its robustness. Because of the screw bosses machined into the unibody backplate, this design should be more solid and compact than the current design. Components will be attached directly to the unibody. The fragility of the glass screen should also be less of a factor. The 4/4S had glass on both sides of the device that was raised above the steel, only protected on its edges by a thin strip of plastic. The new design removes most of the glass from the backplate (only two small pieces remain at the top and bottom for the Wi-Fi, GPS, Bluetooth, and, potentially, NFC antennas) and the front piece now sits flush within the unibody frame. Additionally, the new glass will most likely be Gorilla Glass 2, which is stronger and thinner than the glass used on the 4/4S. This will be a pretty robust housing. The reason the back of the device is still made up of a few different pieces of metal and glass as opposed to one unibody piece is the antennas. Antennas for the most part do not transmit signals through metal. The cell antenna is integrated into the metal case, but there are still separate Wi-Fi, GPS, Bluetooth, and (potentially) NFC antennas to deal with. They need to transmit their signal through non-signal-blocking materials such as plastic or glass. That was why the original iPhone had a black plastic piece at the bottom of the case, why the 3G/3GS's back was made entirely of plastic, and why the 4/4S's back was made entirely of glass. This is why there are the two pieces of either glass or plastic at the top and bottom of this design. I'm sure Apple's designers would much rather have the back be one continuous unibody material. It would look cleaner and be easier to manufacture. Breaking up the back with multiple materials like in this design can start to become problematic aesthetically. It's not as clean looking. I think it's for this reason that Apple has tinted the metal housing black. Clear anodized aluminum or buffed stainless steel would "pop" too much against the black, creating a visual striping effect. Tinting it black starts to integrate the materials a little more. Also helping: the chamfer that runs along the edge of the metal appears to be polished, as opposed to the side, which is buffed or sand blasted. The polished chamfer helps the edge look more continuous and will make this design appear to be even thinner than it already is. There is the additional issue of the camera on the back not being centered vertically with the upper piece of glass/plastic. Instinctively, I want to move it up a millimeter or two as it looks a little out of alignment in its current position. This is probably not possible because of the space the camera requires. On the other hand, in this position it is close to visually concentric with the edge radius of the case. It's not ideal, but it's not bad either. Overall this design is a major improvement over the 4/4S. Functionally, it's worlds better, and aesthetically, I think it's stunning. At first glance it doesn't appear to be dramatically different from its predecessor, but when you really dig into it, there are a ton of changes that make it appreciably nicer. If you aren't excited about it now, you will be when you see one in person. Classic Apple design refinement. The FaceTime camera is now centered above the earpiece. The headphone jack has been moved to the bottom. The two lozenge-shaped speaker grills of the 4/4S have been replaced by a series of pinholes. Because the headphone jack is at the bottom, the lozenges would have been of different sizes and would look odd. The pinholes integrate better into the asymmetrical space. The black version features a black tinted metal. The white version is not tinted. For the reasons I outlined above, this is probably to help visually integrate the different materials. If the metal is aluminum, all it would require is a simple anodize bath to make it black. If it's steel, there are other methods of tinting it black, but I'm not as familiar with those. Regardless, the black tint is not a paint. It's actually part of the metal and would take a major gouge to scrape it away. A smaller dock connector. The rumors were that it would move from the 30-pin connector that has been around for the past decade to a 19-pin connector. The new rumor is that it will be an 8-pin connector. The 8-pin makes more sense to me. First, it would allow for a port that would be impossible to insert incorrectly. Like Magsafe, you could insert it upside down and it wouldn't matter. Apple geniuses would no longer have to fix iPhones/iPads/iPods for broken dock connectors. It's a win for everyone. Second, the dock connector just doesn't matter as much anymore. Airplay, Bluetooth, Wireless sync, iCloud, and on-device software updates do most of the jobs that needed a wired connection. The main job of the dock connector now is to charge the device, which can be achieved with a much simpler connector design. I still think you will be able to back up your device to your computer and use other accessories with this port, but your need to do it is rapidly eroding away. I don't think that the transition to a new port design will be as painful as you might think. Many people buy accessories for their new devices. Rarely do old accessories travel with you to new devices. Many accessories already don't need to use the dock connector. An accessory ecosystem will already exist on day one for the new iPhone. Any manufacturer that does rely on the dock connector will update their devices really quickly or lose out on sales. This is the advantage of having complete control over this ecosystem. Instead of a 10-year death march of eliminating a port for a new standard (VGA, I'm looking at you), you can make the transition in 12 months or less. Quick like a Band-Aid. This post originally appeared on The Tech Block and has been republished here with permission. The Tech Block carries select tech-reated content that's produced in-house or hand-picked from user submissions that meet our criteria. To publish with us or to learn more about the publishing process, visit our publisher page. Don Lehman is a Chicago-based industrial designer and the founder of More/Real, a startup focused on making technology feel like a natural part of our lives. More/Real's first product, Stylus Caps, turns common pens and markers into touchscreen styluses. Don has been honored by the Industrial Designer Society of America, his work has been featured in the CES Innovation Showcase, and his design for the Contigo Autoseal Travel Mug was named by Bloomberg Businessweek as one of the 50 Coolest Designs of the 21st Century.